Celebrate spring with my mum’s French ham asparagus casserole recipe. 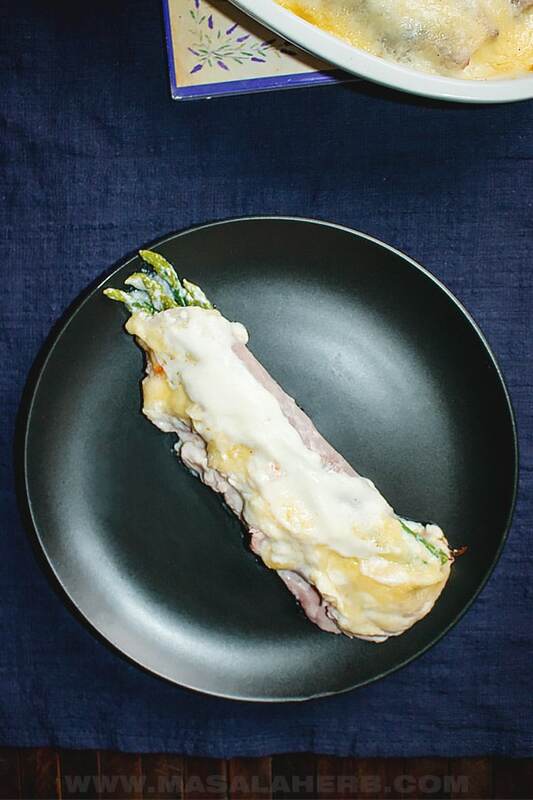 Fresh Asparagus are rolled up in ham and cooked in a casserole dish with a creamy cheesy bechamel sauce. The Asparagus ham roll up casserole topped with bechamel sauce is a perfect family weeknight dinner dish. Comforting and ready within 25 minutes, everyone will enjoy this spring time dish with asparagus. I grew up with this dish made of asparagus, ham, bechamel sauce and cheese. My mum is French and this is a common dinner meal in our family. 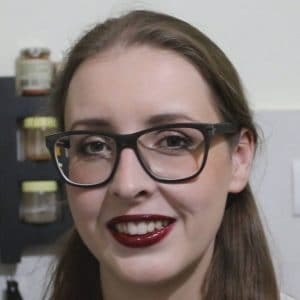 What Asparagus to use in the casserole dish? The Asparagus is a fresh spring vegetable worth enjoying. You can prepare this casserole dish with green or white fresh asparagus. Green and white asparagus are the same variety. The white ones are grown away from sun light so that they don’t turn green. The taste differs a bit. Green Asparagus is the easier of the two to prepare. You just need to rinse the green spears and trim off the bottom if it’s fibrous and getting tough. White asparagus are also peeled, besides trimming off the tough parts. The white ones tend to get fibrous faster too. If you use canned asparagus, you don’t need to boil them because they are soft already. I recommend to use fresh asparagus because the flavors are all the more better. Canned asparagus tend to be soggy and don’t have texture. You can choose between white or green asparagus. I personally prefer the taste of white asparagus in this casserole recipe but the green ones are less work. Choose younger fresh looking asparagus in your grocery store. Thick white asparagus tend to get fibrouse fast. The place of origin (where they were cultivated) is also important, so keep all that in mind. You want to use the ones which are more common localy. 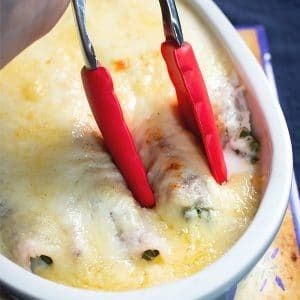 Comforting ham asparagus casserole dish with asparagus rolled into ham and covered by a creamy white sauce and cheese. Make this easy dinner meal tonight! Rinse your Asparagus and trim the tough ends. Bundle them together and tie up, that way it will be easier to take them in and out of the boiling water. Heat up a pot with water and place the asparagus into the cooking water. Cook until tender for about 6 minutes. Take the asparagus out of the boiling water and place into a bowl of ice water to stop the cooking process instantly. That way the asparagus tend to remain green as well. Tap your asparagus dry with a clean fresh kitchen cloth. Place your ham onto your working surface and add some fo the asparagus onto the ham. Roll the asparagus into the ham. Watch the video to see how it’s done. Place the asparagus ham roll-ups into the casserole dish. Heat up your oven to 350 Fahrenheit/ 180 Celsius. Now prepare your sauce by heating up a pan with the butter. Allow it to melt completely. Add the flour to the butter and quickly whisk and mix the butter and flour together while keeping the pan on low heat. In one go pour in the milk and quickly mix the flour butter and milk together. Keep your pot now on medium heat. Whisk occasionally until your sauce has thickened to the desired consistency. Bake at 350 Fahrenheit/ 180 Celsius until slightly golden on top for about 15-20 minutes in the oven. You can use white or green Asparagus. if you use white asparagus, peel them first. Use cheddar cheese or if you can get emmental or raclette. Dear Reader, do you prefer green or white asparagus? This sounds to be really flavorful. Looks so yummy! Thanks for explaining the way you did with photographs. Its quite helpful. One of my favorite ways of eating asparagus! A scrumptious dish. I can’t believe that I’ve never had white asparagus! I heard that the white has a different flavor than green, so I guess I need to check it out. This recipe looks and sounds delicious! Love the combo of ham and asparagus! Hi, this may be interesting you: Ham Asparagus Casserole Recipe!